Recorder player Inês d’Avena specializes in Neapolitan baroque music and is currently a Ph.D. fellow at the Leiden University/Orpheus Instituut. What does one want from an audio recording? Is it the chance to hear a ‘live’ concert, at home? Does one seek to be surprised, either by works or by interpreters? To discover unknown pieces and trends, be part of the excitement of what’s new? Or simply to take pleasure in one hour of entertainment? As a musician, researcher, but foremost as a music lover, I want to be spoken to, and stimulated in my further thinking of music. So, my answer would be: I want a recording to say something to me. Whether ‘live’, surprising, trendy, and/or enjoyable, the works, or rather their rendition, must really grab me, or it becomes background music. If the works do awaken my senses, I will then happily browse through the CD booklet for more information on the performance, wishing to find more on the composers, performers, works, instruments, venues, and anything else which will help me rationalize an instinctive reaction to that recording. The booklet is vital in reasoning what is heard: I want to concur with the other side of the performing wall — the musicians themselves, and their choices. That makes it communicative, and that is what interests me. I suppose I am not the only one who expects a good story, and not only from what I hear, but also from what I read in the text that usually accompanies a (good) CD recording. In specific cases, the booklet of a recording may become even more important than the actual concoction of sounds registered: when the pieces presented have already been recorded before, I want to see why it is being recorded again, especially if I cannot hear why. 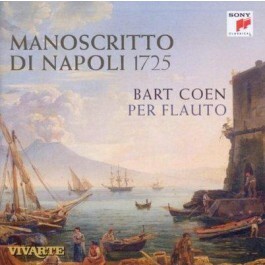 In order to place the discussion on more solid grounds, let’s consider the recently released CD Manoscritto di Napoli 1725 with recorder player Bart Coen and the ensemble Per Flauto (recorded at AMUZ in Antwerp in 2009 and released by Sony Classical the following year). Half of the pieces in the CD aren’t first recordings; a few previous equally successful ones are already available. The works are very interesting, and as a passionate enthusiast of Neapolitan music in general and specifically as a recorder player myself, I cannot tire of this repertoire and will always welcome more — thus rendering my opinion a little biased. The recording and presentation of the CD are superb: everything is clearly and carefully delivered. Although the painting in the cover belongs to a century later than the music, it does its job evoking the Neapolitan scenery, and placing the listener’s mind in the right ambiance. The text about the works is short but to the point, pictures of the musicians are always welcome in bringing audiences closer to a ‘concert going’ feeling, and the fact that all comes in three languages ought to make a larger number of people happy. As the leading figure, Mr. Coen fills his rendition of those attractive works with beautifully fluid ornamentation, and the ensemble that surrounds him is solid and creates a warm sound bed. All in all, I like the recording very much indeed. However, momentarily going back to the question of why musicians do choose to record previously recorded works, I asked myself what this recording wished to offer me and what exactly it communicated to me as a listener. Putting aside the beauty and quirkiness of the pieces, and the utter competence of the top musicians involved, why this recording? And — if we should generalize — why yet another recording of J. S. Bach’s Brandenburg concertos? Or a second recording of A. Scarlatti’s Saint John Passion, to take as example a less known work. If the basic parameters that define a good recording are met, what is it that validates the repetition, for the performers, the recording companies and the audiences? From the point of view of a musician, these questions can be answered with a certain degree of ease: one wants to record a piece (whether a premiere or not) because one wishes to have a say in the matter, and that is valid aplenty. All recording musicians have the genuine opinion that his or her recording will have something else to say. Whether the listener will be able to hear the why depends on an array of things such as the listener’s familiarity with the repertoire or the style, and specific characteristics of one recording compared with the ones that came before. Either way, a valuable communication tool between both sides of the recording wall is the CD booklet which (with luck) holds the musician’s story, the thinking behind the recording, the why which is not (yet) heard. In very good recordings, one can find a whole array of whys. But one crucial factor in the why of an Early Music recording is simply theinstrumentarium. When browsing through a booklet (whether contented by what I hear or frantically searching for a reason to continue listening), one of the elements I am first drawn to in a CD booklet is the musical instrumentarium. ‘What instruments were used’, is a question that is unfortunately not always sufficiently answered in CD booklets. One can usually read at length about the musicians, the composers and their works, and is usually informed about the recording venue but, more often than not, the information on the instruments is scant. Isn’t that odd? If one smells the enticing aroma of skilfully, lovingly cooked food, one naturally wants to know what ingredients make up such delightful dish. In a recording, the instruments are part of the recipe and as primary means of musical expression, I find myself more and more drawn to the actual instruments musicians choose for their recordings. And choice is the imperative word in the matter: musicians choose their fellow musicians, the picture that goes on the cover, and a cluster of other things, but it seems that the choice of instrument is not always a conscious one. I could not find the answer in the CD booklet to Mr Coen’s recording, unfortunately, as it does not offer the listener any glimpse on the musician’s choices. And there are a few out-of-the-ordinary ones in playing the works with recorders in nominal pitches other than the more usually acknowledged options of F and G altos for Italian baroque music — though by analyzing the range of the works, all would be within the range of an F alto — but none of this reckoning is to be found in the booklet. Does the choice of using a flautino in one of the Scarlatti concertos (the least famous one; No. 23 in C Major) offer us a new and personal view on the piece, and if so, what is it? As I could not read about it, I had to make up my own conclusions. For me, this alternative instrumentation confirmed how interwoven the voices are in these pieces, and how strangely exposed the recorder sounds when placed an octave above the ensemble. The use of a voice-flute (a recorder in D) in Scarlatti’s A Major Concerto is also unusual, and since it gives a completely different colour to this work, it would benefit from an explanation in the notes. In any case, these small personal touches do not make clear to me their why for the CD. In not finding their why, I start to long for my own preferences. When recording a whole CD of early Italian harpsichord music, for example, the majority of players would choose for an early Italian model, if only because the intrinsic qualities of the instrument help bring forth and underline the works performed. In a quick (and not all that reliable) search (at the almost inexhaustible website www.recorderhomepage.net), it seems that in 11,000 recordings with recorders (no pun intended! ), only one uses a copy of a baroque Italian recorder, though it is safe to assume that at least a third of those recordings are of baroque works and many of those are recordings of Italian works — symptomatic of a practice of early music that has lost an important part of its unique strive for originality on one side and being bona fide on the other. Why look for a way of setting it apart outside of what the work asks for? In this case, why the voice-flute and soprano if other more conventional and yet innovative options have not been explored? Furthermore — hoping my ears haven’t betrayed me — why copies of non-Italian models of recorders? As subtle variations in models can make impacting differences in sound, and with recorders being reasonably affordable instruments, and recorder players having more than a handful of them for different purposes, I don’t see why not take advantage of this. In times when violoncellos-da-spalla and underhand bowing for cellists are in such a hype, recorder players could benefit from bringing forth their new recordings of previously recorded works with very special care paid to the actual instruments used. But that is my why! It would have been a pleasure to read about theirs.